This deal is a very hot seller. LivingSocial has already sold over 1,000+ vouchers at the time of this post. Community focused and funded, Madison’s 12|12 provides a pleasant space where people can gather, eat, and be inspired. This 71 seat restaurant, funded directly from investors in the Inglewood neighborhood, features menu items such as craft nachos and salads. 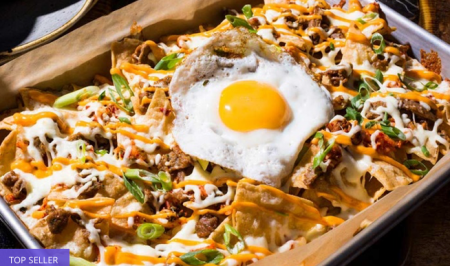 Their Korean nachos, for instance, pile bulgogi beef and kimchi over crispy tortilla chips and top them with a sunny side up egg. Their salads, meanwhile, feature items such as the poke with ahi tuna and mixed greens tossed in a spicy mayo. Not being limited to just lunch and dinner fare, their breakfast foods range from huevos rancheros to fruit bowls filled with blended bananas and topped with granola or other assorted fruits. Promotional value expires 120 days after purchase. Amount paid never expires. Limit 1 per person, may buy 1 additional as gift(s). May be repurchased every 180 days. Limit 1 per visit. Limit 1 per table. All goods or services must be used by the same person. Not valid with other offers or promotions. Not valid for happy hour specials. Merchant is solely responsible to purchasers for the care and quality of the advertised goods and services.